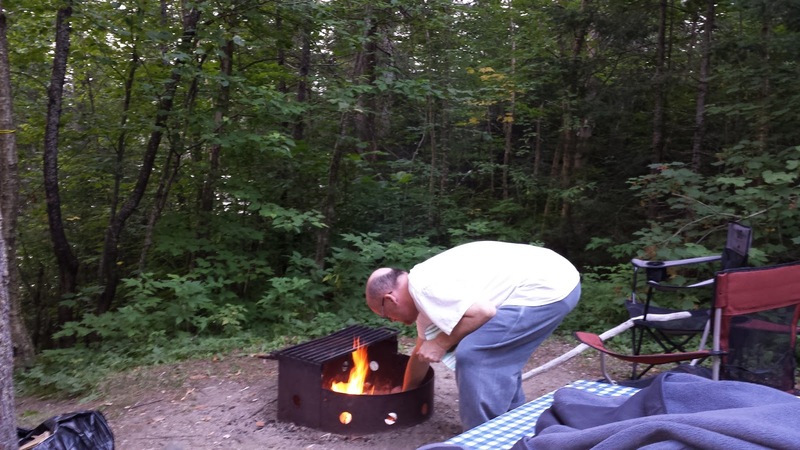 We’re just lighting the campfire at Rabbit Blanket Lake Campground in Lake Superior Provincial Park after another spectacular day. 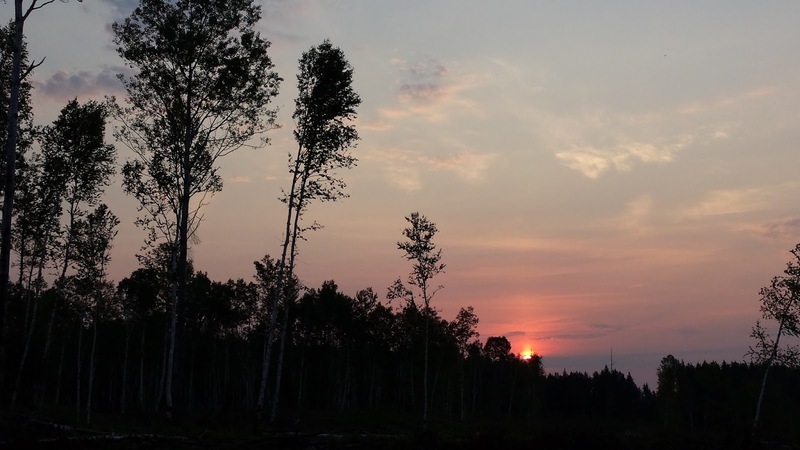 It started off at 5:00 a.m., when we rose early to head up north of Chapleau to the Game Preserve in the hopes of catching some wildlife as they began to be on the move. We had seen a bear the night before, but no sighting of wolves – either last night, or this morning - though we did catch a wonderful sunrise. After breakfast, we left for Wawa taking the highway northwards. It was at this time, I began to realize that I had perhaps not seen wolves because I had mixed my thoughts of hope with thoughts of disappointment and so I decided to tidy up my vibration. Inside my head, I told myself that I had taken action before doing the vibrational work of getting into alignment with what I wanted. At one end of the ‘stick’ was the presence of wolves, and at the other end was the absence of wolves. I had been vibrating somewhere in the middle so I realized that I could not have rendezvoused with them. I started to tell the story of what I wanted – as if it had already been achieved. I said to myself, the Universe has absolutely no doubt about what I want, as I’ve been wanting to see wolves in the wild for many years. Therefore, it’s already done – it’s already in my vibrational ‘escrow’ waiting for me to be a vibrational match to it. So, all I had to do was to visualize it as already done, and find thoughts on any subject that would make me feel good, knowing that this would take me right into the vortex where I would rendezvous with my heart’s desire. I decided to share this aloud with Mark. I had barely finished the sentence, when we turned the corner, and right there, ahead of us, was a beautiful black wolf crossing the road!!! We did not have the camera ready, and it had disappeared into the bush by the time we arrived at the spot where it had crossed. I HAD SEEN MY VERY FIRST WOLF IN THE WILD!!!! After a brief visit to the beautiful town of Wawa to replenish supplies,we headed south towards our next campsite at Rabbit Blanket Lake. On the way, we turned the corner on Hwy 17 and fell upon Old Woman Bay. What a fantastic view that was – and with Lake Superior stretching out towards the horizon. After setting up camp, we took a 10 minute ride back to Old Woman Bay and spent some time jumping the waves, collecting stones, and just having fun! The water was a little cold, but we didn’t notice it after a while. After creating an almost perfect day, we’re looking forward to a really good sleep under the gentle sounds of the wind in the trees at our campsite. 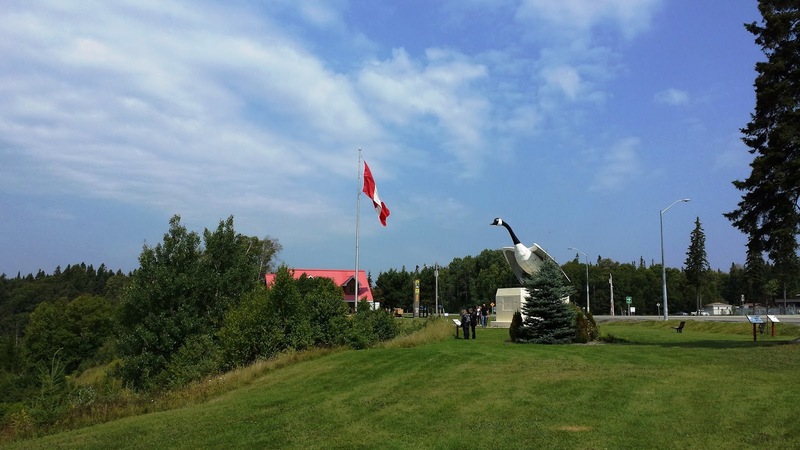 Tomorrow, we head south towards Sault Ste. Marie, passing through some amazing vistas about which so many people have told us. Can life get any better than this? You bet! The best is yet to come!! 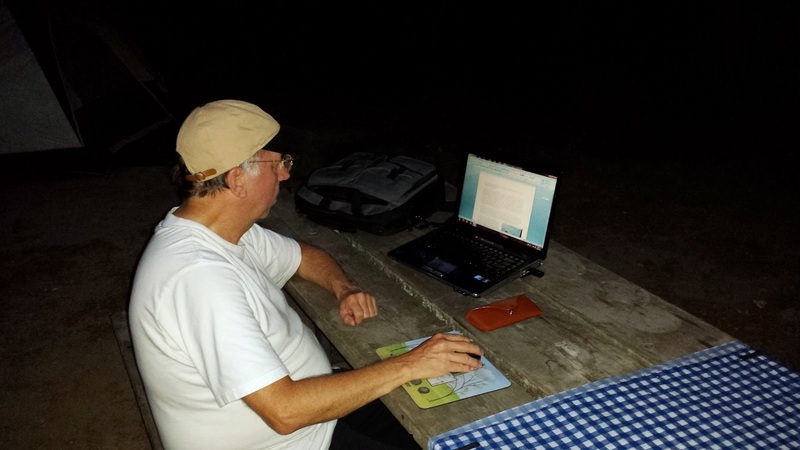 Alan - the 'true camper' composing this blog on camp! Putting Ourselves First - A Path Leading to Love?